Starches are used in many soups and sauces, and act as thickeners that provide additional ‘body’ and creaminess. 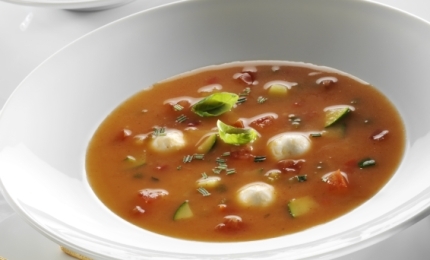 A low gelatinization temperature and high clarity make potato-based food starches the preferred choice in several soup and sauce applications. Pea and potato applications are ideal for these applications due to their high emulsifying functionality. Potato- and pea fibres are excellent thickeners in soups and sauces. As finely milled powder, Emfibre® adds creaminess and allows the replacement of fat in light products. Coarser fibres add pulpy structures to tomato-based products. Fibres are very stable during processing and in frozen products they support the reduction of ice crystal formation, resulting in improved freeze-thaw stability. No allergens are known for both our fibres. These clean label vegetable ingredients add functionality without the need for labelling, thus resulting in foods with a natural, healthy image. 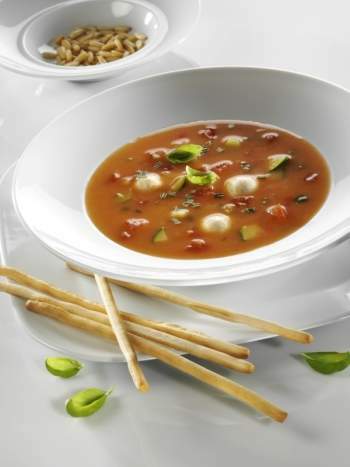 Potato flakes and granules produced from fresh potatoes add functionality in soups and sauces. Whereas flakes are cold swelling, granules can only be used in a hot medium as a thickener. We offer different qualities with alternative properties to control characteristics such as colour, pulpy or long structures, taste and the viscosity of the final product. Clean label alternatives are available.